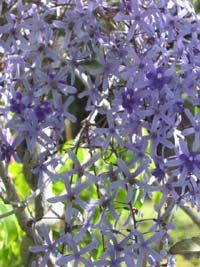 Petrea has several common names; Queen's Wreath, Purple Wreath, Sandpaper Vine, Tropical Wisteria, Bluebird Vine, and Fleur de Dieu. 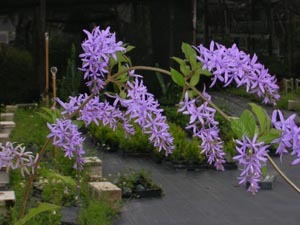 We also often hear many customers say "it looks just like a lilac." This vine does not have a fragrance. 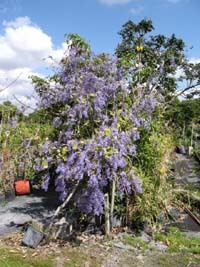 P. volubilis blooms more heavy than P. racemosa. 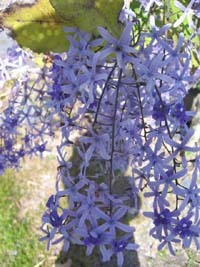 P. racemosa has larger leaves, but both have the rough sandpaper like leaves. 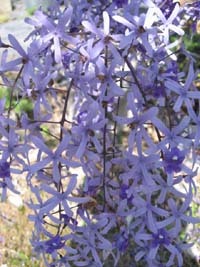 It is an absolutely gorgeous tropical vine when in full bloom. 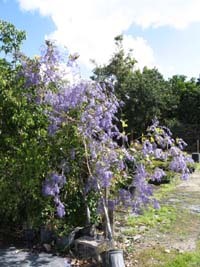 Petreas bloom heavily in the spring, but re-bloom a few times during the warmer months. Older plants bloom more.